And then there were the Valentine’s Days that were painful reminders of love lost and feeling left out of the romance and tender feelings of the celebration of the day. The times when I grew cynical and saw only the shallowness and manipulation behind the holiday from the viewpoint of a disillusioned and broken heart. Now, I’m thankful for Valentine’s Day! It brightens up this time of year when some of us are feeling cabin fever ….. and craving warmth and sunshine. Ground Hog Day, President’s Day, My Birthday and Valentine’s Day all remind me of the promise of Spring. Another chance to be re-born in so many ways and to renew our hope for the future ahead of us. ← Do You Blog? 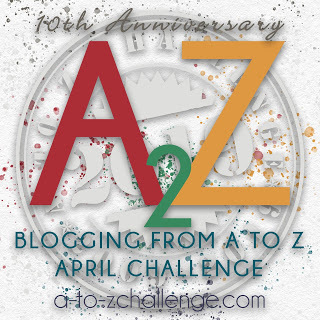 Joined the #atozchallenge yet? Hope you are having a wonderful birthday Mary Lou! Bonjour à partir aux Etats-Unis, Carole!